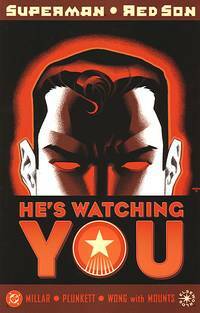 Superman is sixty-three now, the earth is populated by six billion communists. A global Soviet Union. Crime has been eradicated as was employment. Superman, with the aid of Brainiac has literally everything under control. The Batmen, a rebellion force have been brainwashed into Superman's footsoldiers. All of Superman's enemies have been treated in the same way. Brainiac even explains he is now rehabilitated to Kal-El's cause. Superman's fortress is the nerve centre of power, the one place that Superman and Brainiac still have problems with is America. Brainiac suggests that they invade the USA. Superman disagrees telling his 'comrade' that America should be left to either fall or submit themselves. In America in the meantime Lex is plotting away. He is now President, Making a good life for the american people. Not for them but in a masterplan to eliminate the Soviet Union's leader. Lois Luthor and Lois Lane stroll through memories of the now derelict Daily Planet. Although America seems to be on the up, Lois is deeply depressed. Lex had managed to save every business in America except the Planet. Lois feels that Lex deliberately let the Planet fall because he couldn't stand the idea of his wife loving anything other than himself. "Superman might be a nut with a messiah complex, but don't you think we're in danger of just replacing one demagogue with another?" Lex and Agent Jimmy Olsen are onboard Airforce One discussing the President's past failures to destroy Superman. Lex smiles at Jimmy and activates a portal to a secret dimension. Lex unveils to the doubting agent Olsen that he has unlocked the Green Lantern weaponry. Jimmy enquires why Lex hasn't taken the ring himself. Lex explains that he chose a Hal Jordan. A man who has more than enough will power to take down the Comrade of Steel. Lois is soon on Themyscira, home of the amazons. Diana and Lois discuss the failings of man and in particular Lex and Kal. Lois reveals she didn't really visit for sisterhood but to ask for Diana to help support Lex when he launches his next attack on Superman. In Stalingrad, Superman grew weary. A giant bug had attacked the beloved city before Superman arrived to intervene. It is then we discover that Stalingrad has been shrunk and bottled by Brainiac, much like Kandor in our timeline. Superman is disgusted by what his comrade has done and though it was in a time when Brainiac was a villian, Kal El feels it his failing that Stalingrad was never restored to size. The supercomputer distracts Kal by revealing that Luthor's strategic plan, twenty years in the making was finally coming into action. Superman is still not convinced about Brainiac's counter attack and the two comrades are shocked to discover Luthor has infiltrated the Fortress. Hal Jordan gathers troops as Green Lantern ready for an attack while Luthor, Brainiac and Kal walk through the passages of Superman's palace. Luthor mocks Superman's hideaway and its treasures. Kal cuts straight to the point. Lex should be finalising his "ultimate attack" shouldn't he? Lex laughs off his amazonian soldiers and the Green Lantern Marine Corps. Lex wants to go head to head using intelligence to take down Kal. Brainiac calculates that if this were to happen that Luthor could have talked Superman into suicide then wraps the american president in a mass of cables and wires. Just as Superman breathes a sigh of relief Brainiac reminds him that the Soviet Union will fall unless he meets force with force. Superman makes short work of the Corps and steals Hal Jordan's ring - promptly swallowing it. Next in the battle the Amazonian women take flight to battle Kal. Again short work is made of the army. Superman shows no mercy even to his long time friend Diana. Luthor's army of supervillians are the final wave of defence and again they fall. Superman's rage is unrelenting till he comes face to face with the First Lady, Lois Luthor. The Comrade of Steel tells Lois too leave the area as America is finished. Lois is defiant that America is far from destroyed while it has one final weapon. "Well thay say the pen is mightier than the sword, Lois, so I'm distilling everything Superman hates and fears about himself into a single sentence. He might shrug off a nuclear strike but I guarantee this is going to strike that flameproof heart of his." Then his mind wanders further back... to earlier when Brianiac warned that Lex's ninth level intelligence could have had suicidal concequences for the Comrade of Steel. Superman reveals the message with his x-ray vision and is deeply. WHY DON'T YOU JUST PUT THE WHOLE WORLD IN A BOTTLE, SUPERMAN? Brainiac arrives in a giant flying battleship (fashioned after his own face) and asks why Superman resists creating his Utopia. Superman explains he was wrong. He was a bully pushing around a lesser species. Brianiac listens as Superman makes a ground breaking desicion: Leave people alone to make their OWN mistakes. Luthor had shut Brainiac down from within the Fortress of Solitude and with his power down Superman was able to destroy the mechanoid body. Brianiac was not without a contingency plan however and as soon as Luthor shut down his power, Brianiac's battle ship hard drive initiates a self destruct sequence. Superman smiles and flies the ship into space, and records a message to Luthor. "Well played, old friend" he smiles. With Superman's empire of power gone, Luthorism took it's place and quickly and went on to many great things over the next few years... disease and disabilities were gone, a one world government was in place and the entire solar system was now colonised. On the cusp of the fouth millenium, Luthor lay dying in a large cryochamber, with Lois by his side. Asked about his greatest accomplishment Luthor smiled and admitted he felt that nothing could ever compare to rescuing his people from the grip of Superman. At Luthors funeral in the city of Lexor (formerly Metropolis) a man with slicked hair and glasses watches the proceedings from afar, as Clark Kent. Lois Luthor watches as this man fades into the mourniong crowd and Superman discovered what it was like to finally see the world through human eyes... as one of them. Luthor meanwhile did not truly die... his ideals and intelligence lived on through his ancestors. All great figures in history until Luthors grandson to the power of fifty, Jor L came up with the idea that our red son was dimming and as it weakened it would consume us all. This new space age society had grown cold and scientific and firmly against change. No one believed Jor L, so the great scientist devised a time travel device where their son Kal would go to an Earth where the sun was still young -- and Yellow, where he'd be mightier than any mortal. "Goodbye, my son. Go back and change the world so that we might not become this cold complacent lot..."
... to the Ukraine, Russia, 1938...The End. Story - 5: Fantastic end to my favourite Elseworld so far! I still think that it should have been commissioned for a maxi series not a three parter but fantastic all the same! Great work from the entire team and kudos for great entertainment! I love the twist at the end that creates a perpetual loop in the story. Cover Art - 5: OK this title wipes the past two right off the board.